Showing during NYFW is a huge dream of many up and coming fashion designers. But few know how astronomically expensive and sometimes political the road to Lincoln Center can be. The fashion industry by nature can be an extremely treacherous place to navigate through and become noticed. Often times, indie designers with a true love for art and the craft of design aren’t recognized in lieu of more noted names. Fortunately for you, we have been on the prowl and have come across Chicago-based, Detroit born designer Laurie Underwood and her line Wanda Grace. This remarkable talent is definitely one to watch and support. Read our Q&A interview with the designer and be sure to follow and check out her line! ColourByNumbr: Tell me about yourself! Laurie Underwood: I am originally from Detroit, Michigan. I attended Cass Technical High School, where I could focus on Fashion Illustration and Design, as I had started illustrating at the age of nine. I was always so passionate about fashion, that I wanted to go to New York for design school. I had big dreams and I still do… What’s funny is, I never even thought about working for a fashion company, until I got to fashion school in Chicago. All of the fashion students were planning to work for big brands in New York…I decided to stay focused on my goal of having my own line. CBN: How did you start your line? LU: I never really planned it, it just happened because I had previously positioned my mindset to make it happen. So while in design school, I participated in local fashion shows and eventually started designing Lycra dresses. I was designing by the bootstraps…When someone wanted a dress, they would purchase it and I would use those funds to purchase the material and get started on producing the item myself. Eventually, I had outgrown that process and started wanting more for myself and my brand. I’m not where I’d like to be just yet, but the idea is to continue to grow and maintain my brand, while designing quality pieces that speak style. CBN: What caused you to live and work in Chicago versus a larger market like NY or LA? LU: I got the letter that the FIT was full for Fall 2003 and that’s when plan B came into play, which was to move to Chicago and attend the Illinois Institute of Art. But everything happens because that’s how it’s supposed to happen. I’m glad I was not accepted into FIT. I feel like being in Chicago, Wanda Grace can stick out, rather than being in New York, where everybody is climbing on the same small ladder. Besides, I wouldn’t have my daughter had I moved to New York….she’s the best! CBN: How would you describe your own personal style? LU: I try to keep it ladylike. My go-to’s include tie neck blouses, pencil skirts, a tailored pant and pointy toe heels. I always try to make sure my style will introduce me when I step into the room. Image is everything and first impressions are lasting. CBN: Did you face any challenges developing your brand? LU: Absolutely…and all of my challenges have helped me to focus on growing my brand. The biggest challenge that I face as a designer is balancing my time as a mother, a full-time working professional, my tiny social life, and let’s not even mention my relationship. But you have to do what you have to do, if that’s what you want to do. CBN: Who or what are your fashion inspirations, what inspires you to create new pieces? 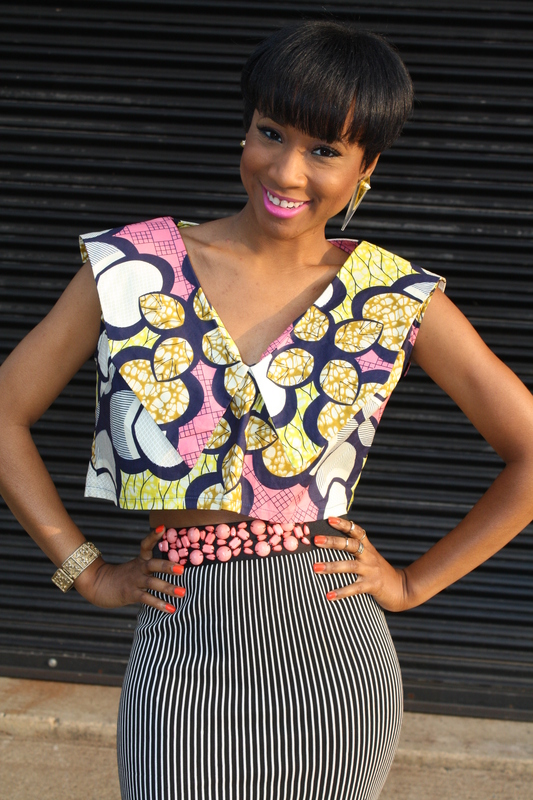 LU: My fashion inspirations are Eunice Johnson of Johnson Publishing, Tracee Ellis Ross, Solange and Janelle Monae. I wear Wanda Grace on a daily basis. So, I’m like my own customer. If there’s something I want to add to my personal style, I’m adding it to the Wanda Grace collection. I’m always inspired by graceful basics that start conversations and I love color. Very seldom do I do anything in black. CBN: What’s your “Master Plan”? LU: I am at the point in my life, where it is now time for me to focus and maintain my standards as a woman– standards when it comes to my style, my organization, my business, my health and so much more. I believe having standards for these types of things allows you to project a polished look to the world. As the one in front of the Wanda Grace brand, having a polished look is very important to me. I’m not trying to be perfect, but I want to live my life the best way I can and empower others to do the same. CBN: Is there anything else that you would like to share with the readers? LU: Since the age of 9, I’ve had this dream to be a fashion designer. Now years later, I am living it. Know that you can do whatever you want and anything is possible with determination and willpower. Always believe in you, even when no one else does.